It’s already one of the best stadia across Asia, but Malaysia wants it to be the single best one. Redevelopment in the suburbs of Kuala Lumpur is now 30% complete. Opened in 1998, the national stadium of Malaysia has recently been undergoing a major redevelopment, aiming at maximizing its leisure and commercial potential. Additional corporate hospitality seating and facilities will be created to boost event revenue. To increase the number and quality of events, retractable seating and roof will be installed as well. As of now we don’t have solid information about capacity change, but the stadium will surely change its seating layout and thus the number. On the one hand, retractable lower stands (to accommodate football and athletics better) and extra hospitality areas mean a decrease in regular seating. But on the other, giant screens will be hanged under the roof instead of their current positions, releasing significant spaces on both ends for expansion. Improved seating and cover will be coupled with a brand new façade, the new signature feature designed by Populous. Consisting of 600 “blades” installed on new steel frames, the outer cladding will provide a more modern appearance with the more traditional current décor hidden behind it, while also sheltering the concourses and becoming a giant multimedia screen for displays. 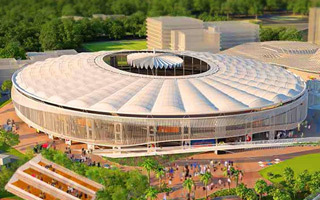 The stadium project is part of a massive revitalization scheme for Malaysia’s national sports complex. Considered underused, other sports facilities of the complex will also undergo significant changes (including national indoor hall, natatorium and field hockey stadium). The 37.5-hectare area around sports facilities will also see numerous leisure and commercial buildings created within, aimed at becoming the leading spare time hub for the entire Kuala Lumpur metropolis. The entire project’s cost is immense, estimated at MYR 14.6 billion ($3.9 billion), of which the stadium itself will cost a tenth (MYR 1.6 billion or $400 million). All of the cost will be covered privately by developer MRCD who, in exchange for the 37.5 hectares given by authorities in leasehold, will finance both their private commercial portion and the public sports features. First phase of the project was launched in fall of 2015 and is currently considered 30% ready. It should see the main stadium prepared to host the 2017 Southeast Asian Games, which means delivery around July 2017. A couple months after the tournament (most likely November) surrounding developments are to begin growing.